Yes…. this. This jacket is cursed. It is the Christine of jackets. 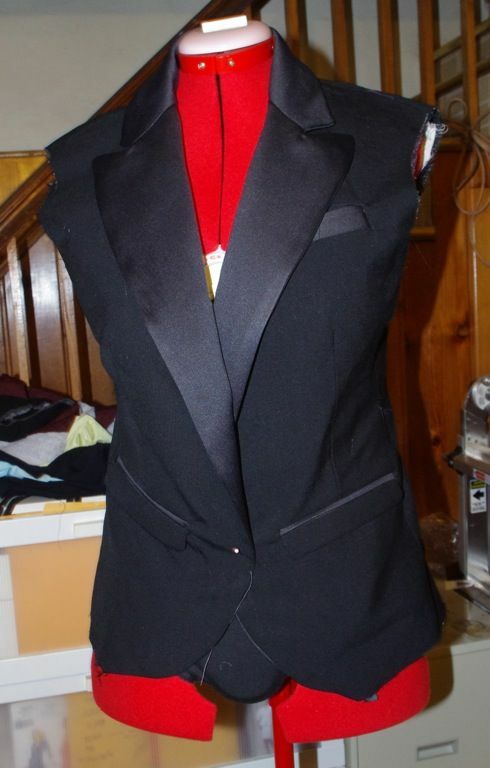 I started this tuxedo jacket in Feburary 2011. Things were going swimmingly until I put the pockets in the wrong place. Then, I didn’t have any lining and had to wait until a run to the store. Once I got the lining that would help the jacket match the tuxedo pants I’d already completed, I was over it. Ten months later I picked the jacket back up only to realize one of the sleeves was missing. This jacket just does not want to get sewn. But, that’s not enough for me to call it cursed. Stick with me here. So, in the last week I’ve cut and sewn the lining. And, I cut and sewed a new sleeve. Well, cut a new sleeve after I spent over an hour looking for the hopsack material to cut the sleeve. Except, once sewn, I realized I’d put the sleeves in backward (wrong arm holes). Cursed. I may possibly be over the jacket again ‘cuz the tuxedo trend definitely seems to be leaving town! Oh. And remember how I sharpeid the grey cloth buttons I had because the shipping on black tuxedo buttons cost more than the buttons? Yeah. Couldn’t find the originals. I suspect they jumped ship with the original sleeve. And this is how it looks tonight. One sleeve in. The other on the cutting table. I’ve done enough battle with this jacket for a few days. I don’t even know why I was so anxious to try and finish! Yes. Time for another break from the tuxedo I’d say. It’s time to admit defeat. Hold an exorcism, and burn the dratted thing. Or, at least, cut it into ribbons with sacrificial shears, so that you are no longer able to drag it out of the trash bin with any vain hope of “rescuing” it. Sometimes you just have to give the Devil his due. It seems to me that the Devil wants to dress in a tuxedo. Looks darn good for a cursed jacket. I think you HAVE to finish it. I read that as “Sharpei-ed”, like you turned the buttons into wrinkly dogs. Which would be pretty cool. Your cursed jacket gave me a good laugh this morning. I’m sorry to hear it’s been such a bear, because you’ve put a lot of time and effort into it you should set it aside again. Maybe the missing pieces will turn up and you’ll be ready to finish it off – one way or another. Is a tuxedo jacket really ever out of style? Life is too short to spend time on projects when you’re not feeling the love. Move on! Cut it short above the pockets, call it a vest and add a peplum and be on the cutting edge. 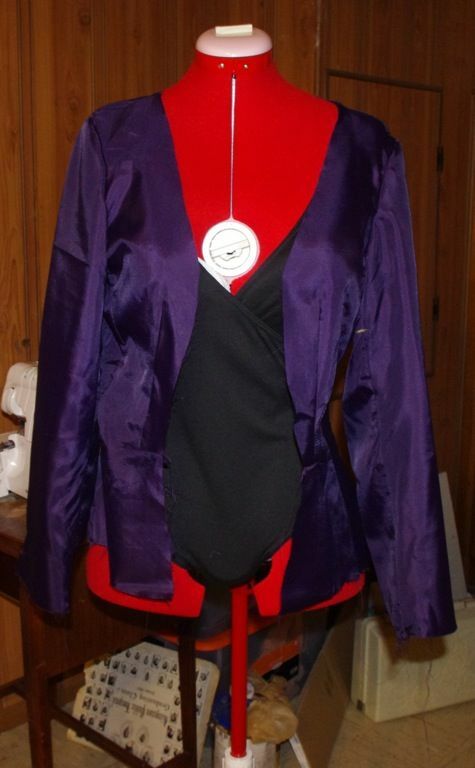 Donate it to a high school who needs an almost finished dress jacket for a play. The pants can go it alone with a black sparkly sweater.I have a dress like this…everything went wrong, I even beaded the entire collar to jazz it up…it still looks awful. It may become a skirt or just go to the Salvation Army later this month. I’ve had a few garments like this and I think it’s my fault. When I make the decision that I dislike something, I think my psyche takes over and makes disaster happen. 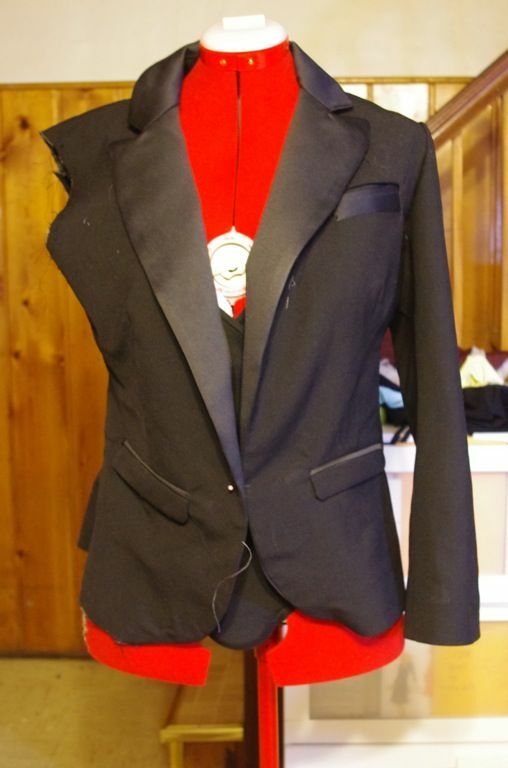 Do you really want a tuxedo jacket? If not, I say cut your losses and throw it out. You could keep the lining for another jacket down the track, perhaps? You totally rocked the H&M tuxedo dress you altered a few weeks ago. Why not turn this into a similar style halter top? This is hilarious. Why this on and off relationship with this jacket? It may just be time to let it go. Oh – don’t give up….you will win….look at it this way….you ah da boss, and eet ees dee subjek and you vell vin beeekahz you are eeen kontrol!!!! The work you’ve already done is absolutely exquisite…to hell if the tux look has left town, when you finish this, you can bring it BACK to town!!!! But it is frustrating. Let it go. The White dress is gorg and that’s all you need. Summer is a commin! Don’t let that jacket treat you like an old bad boyfriend. LOL! Honestly, I think I’d just throw in the towel on this one. You’re going to resent the jacket every time you wear it even if you do get it finished, because it has fought you every step of the way. Don’t get me wrong, it’s just as cute as can be, but I agree with another poster-wear the pants part with a sparkly top and let this go quietly away. I laughed when I read about your ‘cursed’ jacket. I was just cleaning out my fabric closet last weekend, and found a couple of projects that were undone because like you I was over it! When it’s over it’s over!! Thanks for sharing!! You really must persevere. It is a wonderful, keep forever kind of jacket! Set it free…..if you do finish it, you will remember every round of the battle every time you wear it. So stop making a bad memory and move on to something else — and keep your eye out for a great sparkly top to wear with the tuxedo pants…maybe not for a black tie event, but the pants will live to see another day and make you look fabulous during your next girls night out. The tuxedo trend will never leave town!! But I so know this dilemma, when a project just keeps wanting to go south. Even if I finished it, it’d have all this memory of my frustrations and nit-picky problems and I don’t end up wearing it.